Is it possible to rename a SAP HANA Schema? 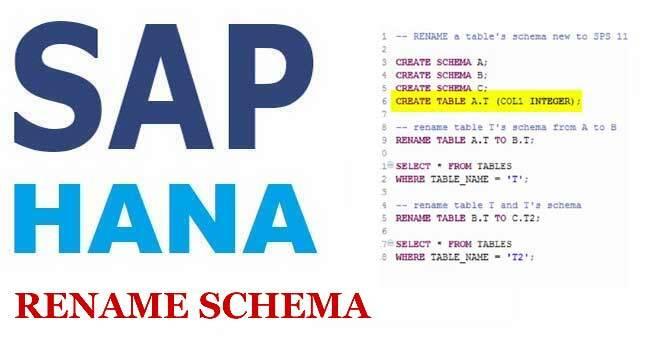 If yes then how can we rename SAP HANA Schema? We cannot directly rename schema in HANA it is not possible but it can be renamed if we export schema as binary and import it with the "WITH RENAME SCHEMA"option. Note: The export location you choose should be an empty directory. IMPORT "SCHEMANAME". "*" FROM '/Saphana/schema-export' WITH RENAME SCHEMA SCHEMANAME TO SCHEMANAME2. SCHEMANAME2 is renamed new schema name, in a new Catalog. 5. At last we have to execute the statement via the green button or F8, and then refresh the Catalog list.